Deer season is over here in Kansas except for an extended firearms season in a small area in northeast Kansas. Is the deer season over where you hunt? Did you get that big buck you where after? If so send us some pictures to share with our readers. It was a good deer season for us here in Kansas, but it was tough. We were hit by EHD pretty hard and it made for some really tough hunting and there were not a lot of big bucks to be found on the properties that I was hunting. I was still able to film myself shooting a nice buck with a bow but he was no monster by Kansas standards for sure. Hopefully next year will be better but we will just have to wait and see. The Kansas deer season is over for 2012. The DHBB forum has had some issues lately but I think we have them fixed and it should be up and running now. If you get a chance stop by and check it out. 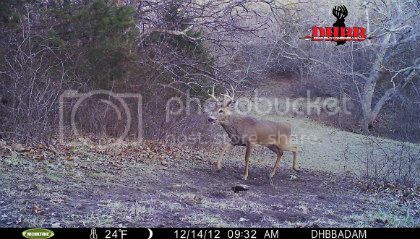 You can share hero pictures, share trail camera pictures, talk deer hunting. You can also buy or sell hunting equipment, buy or sell video equipment and more. So stop by and check out the DHBB Forum if you get a chance. We have had two snowstorms the past couple of weeks here in Kansas and this time of year can be tough on whitetails. Food sources become harder and harder to come by, that’s why if you can plant food plots and implement some type of supplemental feeding you can really help the overall health of your deer herd. The more quality food whitetails have during the cold months of winter the better. Does are pregnant and need nutrition for their babies and bucks are trying to recover from the rut and gain back the weight they lost chasing those does. I have been putting out corn for the deer behind my house because there just isn’t much food for them this time of year. Year before last I saw a doe that was staving and freezing to death and it wasn’t pretty. I plan on doing some coyote hunting in the next couple of weeks, I have seen quite a few lately, I guess the cold snowy weather gets them moving more looking for food. I’m gonna see if I can’t thin them out a little. Tagged deer season. Bookmark the permalink.